Smart cameras are individual image processing systems designed to automate decisions in an industrial capacity. These video cameras link an image sensor with a processing unit to determine the next desirable step of a mechanical process. They are smaller than PC-controlled machine vision systems and may not offer the same features or interface, and also operate with a ‘set-and-forget' mentality. Most smart cameras do not provide a video feed, but instead offer data based on the internal analysis. Smart cameras possess the unique capability of individually analyzing images and communicating this data with external industrial regulators and interfaces. This allows the automation of simpler processing decisions, and their small footprint and internal (and often very powerful) processors make them more flexible than machine vision sensors. Frequently, smart cameras are linescan instruments with exceptional one-line resolutions. Smart cameras do not have a distinct appearance versus other camera types, but are rugged to maintain effectiveness in harsh environments. Without the need for particular imaging features, CCD and CMOS image sensors are common for smart cameras. Since a smart camera's imaging capabilities are seldom displayed, monochrome sensors are often satisfactory. Several smart cameras can be linked to create a unified vision system. Smart cameras incorporate important communication (e.g. Camera Link, GigE Vision, USB, FireWire) links to send data to industrial components and remote interfaces. Since smart cameras are implemented circumstantially, some development cost can be expected. As with other types of cameras, the lens plays a critical function in imaging quality. Lenses accurately refocus the field of view onto the small and sensitive image sensor, and also clear up any optical aberrations that occur. Camera lenses are marketed in standardized styles according to mounting. Resolution is the overall clarity of the image when displayed, as determined by the pixel count of the image sensor. For smart cameras, resolution ranges from 640 x 480 to 1600 x 1200 are most common. Linescan cameras have similar, one-line resolutions. In general, the lowest acceptable resolution should be used to keep camera processing manageable and quick. Many smart cameras have an integral strobe to ensure proper illumination. This also reduces wiring, additional hardware, and shortens imaging processing time, essential components with machine vision systems. Smart cameras have image capture rates of 25—35 frames per second, though many cameras have partial modes capable of capturing 100 frames per second. Frame rates should not exceed to computational abilities of the processor, but that is only relevant on older-model smart cameras as processors become more capable. Indeed, high speed smart cameras have prevalent. This is responsible for the duration that light reaches the image sensor, and is usually controlled by an electronic shutter. It directly controls the exposure rate along with the aperture. 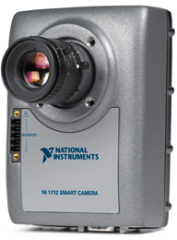 Common smart cameras are programmable to have exposure times from 22 µm to 1,000 ms. This feature is largely dependent upon the requirements of the vision system's processes. Smart cameras with other exposure times, even those mimicking high speed cameras, are available. Many smart cameras incorporate mounting holes for brackets and extendable arm mounts. For brackets, typically two connection points are sufficient for proper positioning. Since smart cameras are not monitored by an operator, they almost never utilize handheld or portable frame designs. Dust, tampering, and moisture covers can extend the life of smart cameras. High-Speed Camera: High-speed cameras record images at a higher frame rate than a typical camera. After recording, the images can be played back in slow-motion for close study of actions that may be ephemeral. This is particularly helpful for scientific study, but also has a wide variety of uses. Almost all modern high-speed cameras are digital in design and capable of recording over 1000 frames per second. Too many frames per second sacrifices area coverage while also producing a large, unwieldy file. Low-Light Camera: These are meant to be used in dark situations where an otherwise suitable camera will not reach an exposure level capable of capturing an image. The cameras contain image sensors that are exceptionally perceptive of subtle light sources. Radiation Hardened: Devices are designed to withstand high levels of radiation. These cameras can be used in nuclear facility applications, or in scientific research that will expose the device to radiation. Smart cameras are successful for non-contact measurement, product and processing inspection, quantifying, sorting and identification, code reading, robot input, and an otherwise endless list of employments. Due to their small size and ease of connectivity, sart cameras are only limited by the innovation of the operator. It is common to find smart cameras in automobile assembly, pharmaceutical processing, product and food packaging, quality control roles, and automated surveillance. Astonishingly, advanced security cameras can identify threats independently and alert authorities.